The EVPD Proportional Valve Driver is an interface device to control Clippard's DVP and EVP Proportional Valves with signals that are typically available from micro-controllers, PLCs and industrial computers. It generates a high power output current to drive the proportional solenoid valve in response to a low power proportional command signal. 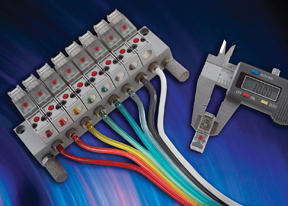 User-adjustable controls allow the output to be optimized for a specific application. 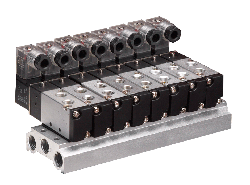 Clippard EVP Series Proportional Control Valves combine the features of the well-known and trusted original EV Series valves with the additional capability of proportional control. The EVP Series provides air or gas flow control, and varies the output flow based on the current input to the solenoid. The consistent gain of this valve provides a high degree of control for many applications. All of the benefits of Clippard quality and reliability are available in these 10mm and 15mm valves. Offered in both Normally-Open or Normally-Closed models, these 2-way and 3-way valves are perfect for small and compact areas where pneumatic controls are needed. Clippard Maximatic® solenoid valves are available in 2-way, 3-way and 4-way configurations in port sizes from #10-32 to 1/2 NPT. Select either a direct-acting poppet or solenoid-controlled pilot operated balanced spool design. Spool valves are body ported but can be bolted to a parallel circuit manifold.